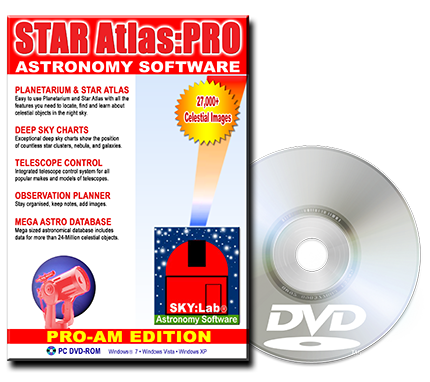 STAR Atlas:PRO™ PRO-AM Edition is without doubt the most powerful, impressive and exciting version of STAR Atlas:PRO™ ever released making this edition a must have for amateur astronomers of all levels! Features include a Celestial Image Library of more than 27,000 celestial images linked to deep sky objects, allowing you to wander star charts and display images of star clusters, galaxies and nebula when you point and click. More than 13,500 individual deep sky objects are pictured each accompanied by a negative image to help with highlighting faint details. New in this version are an additional 2.5-million stars from the Tycho II astrometric and photometric reference catalogue down to Magnitude 11 providing more detailed star charts than ever before. STAR ATlas:PRO™ now includes the the Minor Planet Centre's Orbital Database (MPCORB) of almost 200,000 Asteroids and Minor Planets. Now you can easily locate and identify Asteroids and Minor Planets and chart their movement through the sky. The new Hyper-LEDA catalogue, now included, contains a massive galaxy database from the HyperLEDA catalogue which includes the entire Principal Galaxy Catalogue (PGC) of more than 1.3-Million Galaxies and 200,000 other non-stellar objects. A vastly updated list of over 550 deep sky objects with popular names (Boomerang Nebula, Gomez's Hamburger, Hoag's Object, McNeil's Nebula, Parrot's Head Nebula, Red Spider Nebula, Spirograph Nebula, and... over 500 more!). In this edition of STAR Atlas:PRO™ the information on the status bar moves to the application title bar providing you with star charts that fill your entire screen. There are many other new refinements too including faster chart drawing, an updated list of deep sky objects with popular names, telescope alignment stars and more. SKY:Lab Astronomy Software proudly sponsors the Queensland Astrofest in Queensland, Australia. SKY:Lab Astronomy Software proudly sponsors the Readers Photos Competition in Sky & Telescope Magazine. SKY:Lab Astronomy Software proudly sponsors the IceInSpace AstroCamp in New South Wales, Australia.